Ideal for communicating with large audiences. Ideal for audiences up to 2,500 people and rooms up to 10,000 sq. 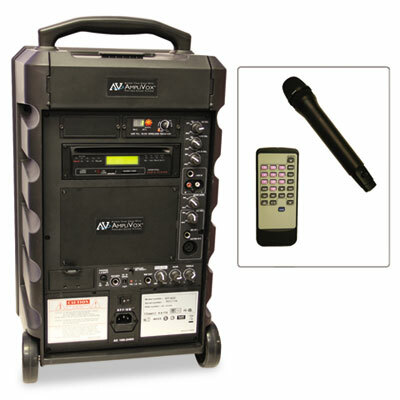 ft., this portable PA system features a powerful amplifier to fill the room with rich, clear sound. Built-in digital wireless receiver can be used with a wireless microphone, so you can move around and interact with your audience. Play music with the integrated CD player and enjoy clear, full sound. Lightweight design, wheels and retractable handle make it very easy to move. Use the PA system inside or outside, thanks to the power cord and long-lasting rechargeable battery. Keep your microphones, battery cord and other accessories organized in the storage compartment.